It's a debate that rages each year when the clocks go back - should Britain extend summer time to create lighter days? The answer, according to a couple who have already made the leap themselves, is undoubtedly yes. 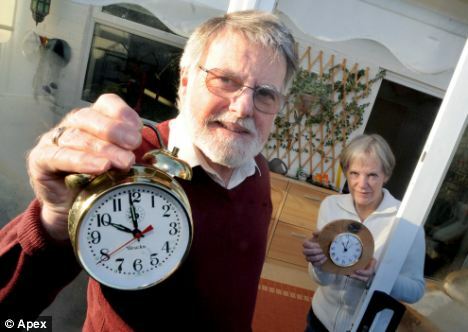 John and Janys Warren stopped putting their clocks back in the autumn when they realised the darker days were triggering his cluster headaches. They now live an hour ahead of everybody else during the winter and say the move has drastically reduced their heating and lighting bills. Mrs Warren, 66, said: 'We have lower fuel bills and far more usable daylight hours with evenings not seeming endless. 'We don't put the heating on until we get up and by then it is warmer anyway. We've saved about one third on our heating and lighting bills. The couple, from St Georges near Weston-super-Mare, Somerset, say they don't have to fit in with the rest of the world now their seven children have grown up. They started living permanently in British Summer Time - known as 'Double British Summer Time - four years ago. Experts believe changes in the body's biological clock could trigger severe headaches. Mr Warren, 70, the retired general manager of a refurbishment company, said: 'We stared it because my cluster headaches were getting really bad and I could get up to eight attacks a day. 'I was receiving palliative care and being given morphine in hospital to reduce the pain. 'Then Janys heard someone who suffered from the same thing went to Australia, did not change his clocks, and did not have an episode. On a typical day, the couple get up at 8.30am 'their time' - 7.30am in 'our' time - and go to bed at 11pm, which is 10pm for the rest of us. Mr Warren said: 'It just a far more pleasant way to live through the winter. You get far more daylight and you don't get endless dark evening. As a result of their clock change, the combined gas and electricity bill for their three bedroomed semi-detached home is just £700 a year. Mrs Warren added: "People who come to the house sometimes look at the clock and say "Goodness, it's time to go", and we explain. 'Of course one of the things it makes a difference to is parish council meetings. 'They don't start for us until 8.30pm, but it means they can sometimes go on until 10.30pm or 11pm. 'Even if the UK stayed on British Summer Time we would be closer to Europe Time, which has got to be an improvement for trade and tourism. Parliament is now looking into extending British Summer Time into winter after The Energy and Climate Change Committee heard a talk in favour of the change in October. Campaigners claim it could boost tourism by up to £4billion and create 80,000 jobs. They also say brighter evenings would prevent at least 100 road deaths a year and save the NHS around £138million annually, by reducing accidents in the darkness.